(Photos by Staff Photographer Thomas Cordova). Phantom Carriage is an ambitious endeavor, focusing on brewing sour beers (although they have carefully selected guest taps, too) and a small plate menu in their charming (inside at least) brewery on Main Street in Carson, a stone throw away from the Goodyear blimp’s airfield. 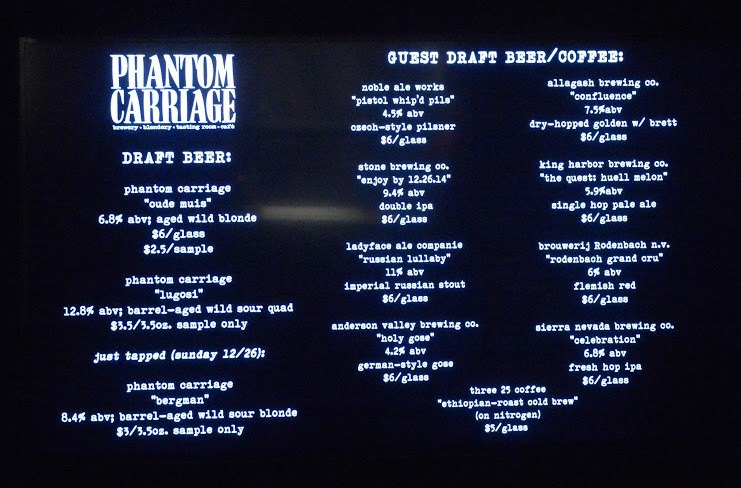 Read more about Phantom Carriage here and check out an example of their beer offerings below (caution: this list may not be accurate, but is intended to provide an idea about the brewery’s offerings). 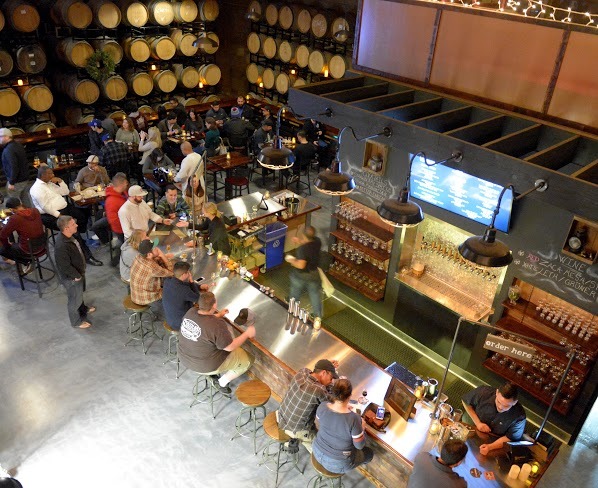 The venerable Red Car Brewery and Restaurant in Old Torrance predated the glut of small craft breweries that have sprouted in recent years in the South Bay. Brewmaster Bob Brandt brews a batch in the above video. BTW: the holiday season means its Night Train time at the Red Car; as the name of the brew suggests, it packs a wallop. 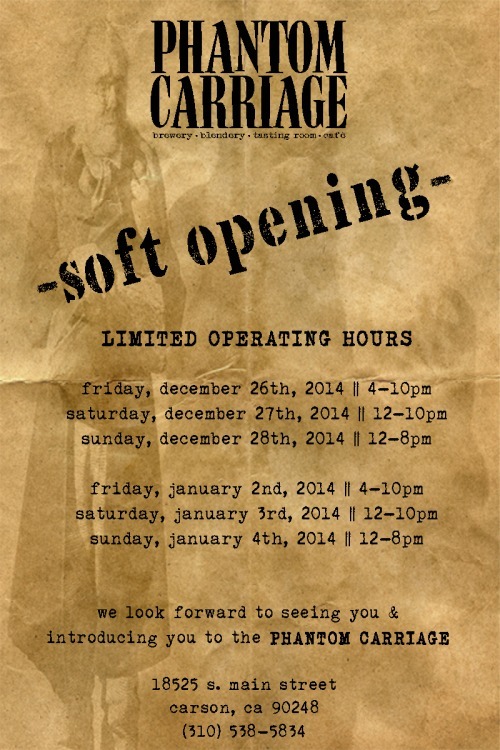 Need a last-minute (and early) gift idea for the craft beer drinker in your life? Then trust me they will love a ticket to this epic holiday bottle share — check out the incredible beer list here — hosted by King Harbor Brewing Company in Redondo Beach. With a beer line-up like that there should be no problem pairing the appropriate brew with the barbecue on offer — and it’s all for a good cause. Smog City gets funky with the release of its first wild ale, a dry-hopped Brett Saison — Brett refers to a strain of yeast, BTW — when its Del Amo Boulevard doors swing open at noon Saturday. 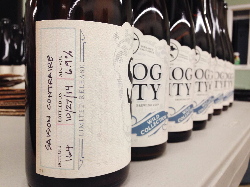 You can read more about so-called wild beers here clicking on this Beer Advocate link. Incidentally, Smog still has its Coffee Porter and Sabre-Toothed Squirrel available in bottles for $1 off during the holiday season, while growler fills are $2 off. Nothing says the holiday season to a craft beer fan than a winter-warming porter so the first bottle release Wednesday by Torrance’s Absolution Brewing Co., is especially welcome. 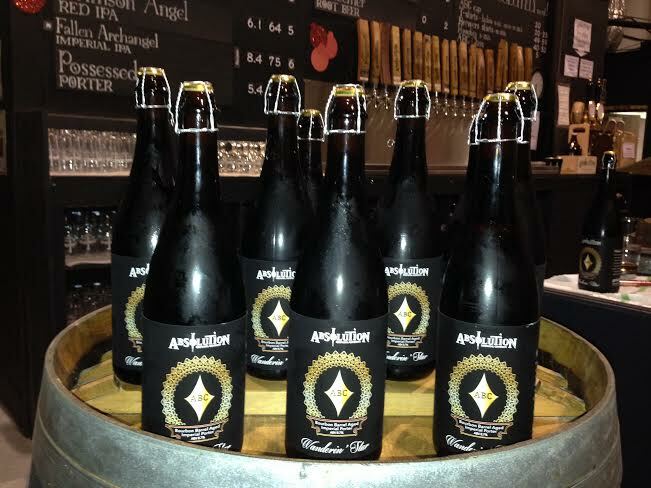 A 750 ml bottle of Wanderin’ Star Bourbon Barrel-Aged Imperial Porter costs $18 (it’s also on tap at the brewery). Tasting room hours are 3 p.m. to 9 p.m. Wednesday and Thursday, 11 a.m. to 9 p.m. Friday and Saturday and noon to 6 p.m. Sunday. Winter is just around the corner, and it’s the time when beer lovers traditionally indulge in dark beers — porters and stouts. One of the more indulgent dark beers out there is Hangar 24 Craft Brewery’s Pugachev’s Cobra. 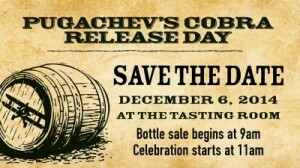 Part of the brewery’s Barrel Roll series, Pugachev’s Cobra is a Russian Imperial Stout aged eight months in bourbon barrels. It’s full of flavor and plenty of alcohol (this year’s batch packs a whopping 18.9% alcohol by volume). The past few years, the Hangar 24 has celebrated the beer’s release with an event it calls Pugafest. This year’s Pugafest is Saturday (December 6).